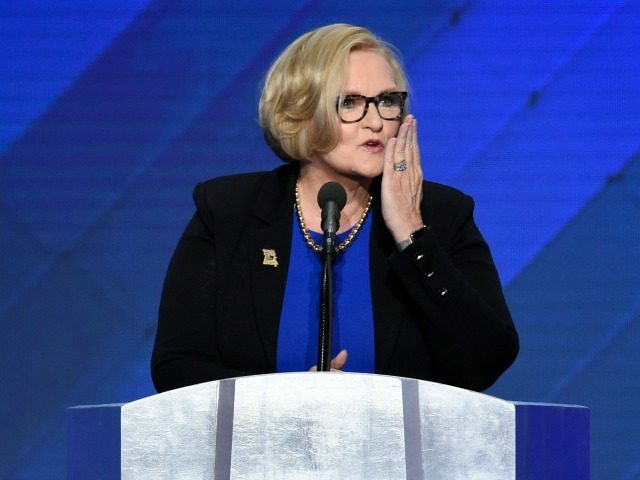 Senator Claire McCaskill (D-MO) admitted Tuesday that she, her husband, and their private family foundation donated a total of $1,000 to the American-Russian Cultural Cooperation Foundation, on whose board of directors Russian ambassador Sergey Kislyak serves as honorary chairman. Referring to stories in March describing McCaskill appearing at events where Kislyak also attended after tweeting that she’d had no encounters with the Russian ambassador, Senate Leadership Fund spokesman Chris Pack said the revelations about the donor and dinner at the Russian embassy continued a “web of lies” that McCaskill has constructed around her encounters with Kislyak. But McCaskill said she had not even talked to Kislyak at that 2015 dinner, that the donation was at the behest of friends of Symington, and that Republicans and Democrats for years had supported the organization. “Again, as a senior member of the Armed See, never received call or request from Russian Ambassador for meeting. Never met one-on-one w/him,” McCaskill tweeted. When asked by Breitbart News why she claimed she had never met or spoken with the Russian ambassador when her Tweets showed otherwise, McCaskill’s communication director defended her by saying she had not met “one-on-one” with him. . .
“Claire has never met one-on-one with the ambassador, and never received a call from him,” LaBombard said. “She did attend a group meeting about adoptions with other senators, and had a brief proactive call with the ambassador amid calls to several other parties to the Iran nuclear deal. But two donations, $15,000 to Planned Parenthood and $873 to the American-Russian Cultural Cooperation Foundation, have raised red flags for Republican opposition researchers in this charged political environment. The $873 contribution was part of an intended $1,000 donation on behalf of former Missouri Rep. James Symington, and was reduced when McCaskill and her husband paid for their own meals at a November 2015 dinner at the Russian embassy because of the foundation’s rules, she said. McCaskill said she attended the dinner because Symington, a mentor, was being honored as someone who has long been involved with efforts to improve cultural relations between Russia and the United States. Moscow’s top diplomat in the U.S. — the central figure in suspicions about Donald Trump connections with Russia — is returning to his country after almost a decade in the job, a former U.S. official confirmed Monday. Sergey Kislyak, 66, will depart his position as Russian ambassador to the U.S. at the end of the summer as part of a long-planned rotation, two other U.S. officials told NBC News. In the space of a few weeks, contact with Kislyak has led to the firing of a top adviser to the president and prompted calls for the attorney general to resign. Trump’s son-in-law Jared Kushner and ousted national security adviser Michael Flynn met with Kislyak at Trump Tower in December for what a White House official has since described as a brief courtesy meeting. . .
Attorney General Jeff Sessions caught flak for failing to disclose during his confirmation hearing that he met with Kislyak twice during the 2016 campaign. He bowed to pressure in March by recusing himself from any federal probe of Russian meddling in the election. NBC News made no mention in their story of Sen. McCaskill’s meetings with Kislyak or of her donations to the foundation on whose board he serves. The revelations about her connections to Russian ambassador Kislyak have put McCaskill on the defensive as she gears up for what looks to be a tough 2018 re-election battle. Missouri is one of ten states Donald Trump won in 2016 where the incumbent Senator is a Democrat up for re-election in 2018.